The last round of voting really came down to the wire, with both Cake Conference winners claiming victory by a hair. In both cases, we had upsets — making today's conference championship even more exciting. #3 Red Velvet Cake took down #2 Ice Cream Cake by precisely 200 votes; even more shockingly, #4 German Chocolate Cake knocked out the #1 seed, Birthday Cake (also a squeaker, coming down to a matter of 250-odd votes). 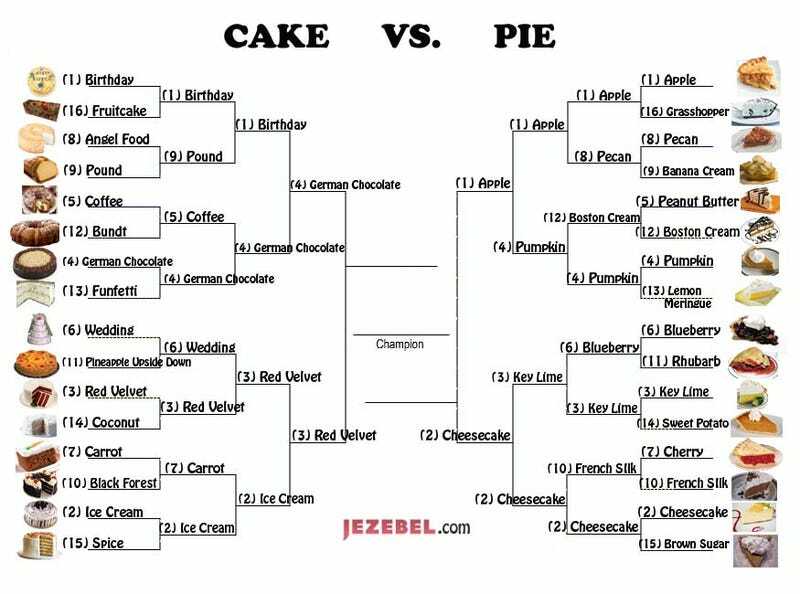 Red Velvet and German Chocolate will ascend to the Final Four, guaranteeing that the championship match will not feature a #1 seed and demonstrating to us all that the universe is not set in stone. Over in the Pie Conference, the pie-loving public was forced to look deep inside themselves and listen to their soul, making the tough decision to vote #1 Apple the winner over the emotional #4 Pie. And in what was a less-close match (at this stage in the game, some might call it a massacre), #2 Cheesecake won over #3 Key Lime. And now, the Conference Finals — a conference champion will emerge from the field of its peers, and will move on to fight for the ultimate honor. It's the Final Four. #3 Red Velvet Cake faces off against #4 German Chocolate. #1 Apple Pie looks deep into the eyes of #2 Cheesecake. * The future is wide open. Because this is a special match, the polls will stay open through the weekend, closing on Monday 4/5 at 12pm EDT. Be sure to vote in both matches, and ready yourself for Monday's championship game. Godspeed, delicious friends.